MONTHLY DONORCEO GEMServers LLC, once saved by the charity of others. John joined Watsi on March 10th, 2015. Four years ago, John became the 996th member to automatically support a new Watsi patient every month. Since then, 4,101 more people have become monthly donors! John's most recent donation traveled 8,700 miles to support Joshua, a boy from Tanzania, to fund corrective surgery. John has funded healthcare for 46 patients in 12 countries. Sanay is a three-month-old baby girl from Burma. She lives with her family in Mine Kan Village, Hpa-An Township, Karen State. Only her 19-year-old brother is currently working and supporting their family. He works at a chicken factory in Bangkok. 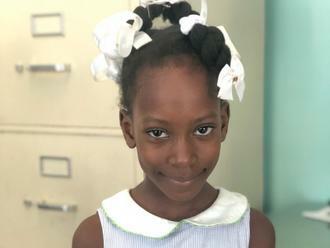 Sanay was recently diagnosed with hydrocephalus, which has caused fluid to build up in her brain. Without immediate surgery to alleviate the intracranial pressure that the excess fluid is causing, she is at risk of developing severe, potentially fatal medical complications. Our medical partner, Burma Children Medical Fund, is requesting $1,500 to fund the insertion of a ventriculoperitoneal shunt for Sanay, which will drain the fluid that has accumulated in her brain. The procedure is scheduled to take place on September 6, and, once completed, will greatly improve Sanay's quality of life. “I want my daughter to become a nurse when she grows up,” says Sanay’s father. Khem is a rice farmer from Cambodia. She has three daughters, six sons, and twenty grandchildren. She likes to visit the local pagoda and listen to monks pray on the radio. 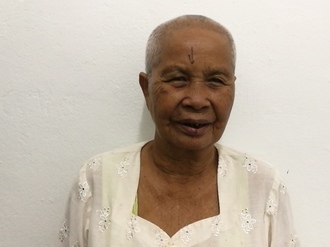 Two years ago, Khem developed a cataract in each eye, causing her blurry vision, photophobia, and headache. She has difficulty seeing things clearly, recognizing faces, and going anywhere outside. When Khem learned about our medical partner, Children's Surgical Centre, she traveled for four and a half hours seeking treatment. On June 5, doctors will perform a small incision cataract surgery and an intraocular lens implant in each eye. After recovery, she will be able to see clearly. Now, she needs help to fund this $398 procedure. She says, "I look forward to going to the pagoda, joining in on ceremonies, and taking care of my grandchildren." Faith is a green grocer from Kenya. She is married and a mother of three children. Her husband is a driver and their combined income is barely able to pay their rent and sustain the family. Faith has been diagnosed with breast cancer. Without treatment, the cancer may spread to other organs. A mastectomy, a surgery to remove breast tissue, has been suggested to rid her body of breast cancer and to prevent the cancer from metastasizing. Our medical partner, African Mission Healthcare Foundation, is requesting $816 to cover the cost of a mastectomy for Faith. The procedure is scheduled to take place on November 6. After treatment, Faith will hopefully return to a cancer-free life. Faith says, “It’s my hope that someday I will be cancer free. My children are young and need me."